It doesn't matter whether what you tell people is truth or fiction, because there's no such thing as truth, no real difference between fantasy and reality, so you might as well go with the more interesting story. That's "Life of Pi" in a nutshell. Sorry to spoil it for anyone who hasn't read it yet. Remember that season of the TV series "Dallas" that turned out to be just a dream? That's kind of how you feel after you've invested hours of your time reading page after page of a quite engrossing survival narrative, only to find out that it was all something the survivor made up. Or was it? Ah, there's the twist that we're supposed to find so clever. But the officials from the ship company who tell Pi they don't believe his story are such hopelessly weak strawmen that the author pretty much forces you to accept the "better story." Pi, and, by extension, Martel, have no patience for the "dry, yeastless factuality" that the ship officials want, you see. Never mind whether it's closer to the truth -- it's just too boring, and we need colorful stories to make our lives richer. Besides, Pi and Martel say, as soon as something leaves your mouth, it's no longer reality -- it's only your interpretation of reality. So why bother grasping for the truth? You prefer the Creation story to the Big Bang? Then go with the Creation story, even if it defies logic and scientific discovery. That's all well and good. Everyone likes a good story. But there's a time and a place for them, and the ship officials didn't need a story -- they needed to know what happened to their ship. To that end, Pi's entire tale is irrelevant anyway. And that, in turn, makes you wonder what the whole point of the book was. Other than, maybe, to laud the power of storytelling in a really hamfisted manner. Or to advocate for taking refuge in fantastical fiction when reality is too harsh. Or to champion shallow religious beliefs ("Why, Islam is nothing but an easy sort of exercise, I thought. Hot-weather yoga for the Bedouins. Asanas without sweat, heaven without strain."). Or to bash agnostics. Or something. Be advised that this is not a book for children or the squeamish. Pi's transformation from vegetarian to unflinching killer, and Richard Parker's dietary habits, are rife with gratuituously gory details about the manner in which animals suffer and are killed and eaten. The story promises to make you believe in God. Yet with Martel's insistence that a well-crafted story is just as good as or even preferable to reality, he leaves us not believing in a god of any kind, but rather suggesting that we embrace the stories that religions have made up about their gods, regardless of those stories' relation to scientific knowledge, since the stories are so darn nice, comfy, warm, and fuzzy in comparison with real life. Whether the God in the stories actually exists, meanwhile, becomes totally irrelevant. So ultimately, Martel makes a case for why he thinks people SHOULD believe in God -- it's a respite from harsh reality, we're told, a way to hide from life rather than meet it head-on with all of its pains and struggles -- and that's quite different from what he ostensibly set out to do. He trivializes God into a "nice story," a trite characterization sure to offend many readers. Pi sums up this postmodern worldview by telling the ship investigators, "The world isn't just the way it is. It is how we understand it, no?" Well, no, the world IS just the way it is, in all of its highs and lows, triumphs and tragedies, happiness and sadness. But Pi and Martel's solution is to avoid the whole messy thing altogether, pretend that the way things are don't really exist, and pull a security blanket of fiction over your head. Create your own reality as you see fit. That's called escapism. It's fine when you want to curl up with a good book on a rainy day and get lost in the story for a few hours, but it's a lousy way to try to deal with real life. Pi would tell me that I lack imagination, just as he told the investigators they lacked imagination when Pi claimed he couldn't "imagine" a bonsai tree since he's never seen one, as a way of mocking the investigators' reluctance to believe in Pi's carnivorous island. (Nice cultural stereotyping with the bonsai, by the way -- the investigators are Japanese.) But you see the problem, right? It's not a matter of lacking imagination. It's a matter of conflating things that are obviously imaginary with things that are obviously real. They're not one and the same. It's ludicrous to suggest otherwise. You might as well say that the story of Frodo and the Ring is every bit as real as the American Revolution. Pi also tells us, quite pointedly, that choosing agnosticism is immobilizing, while atheists and religious folks make a courageous leap of faith. Yet immobility is precisely where Pi places us, so that by the time the book ends, you're stuck not knowing what to think about what you've just read. Do you accept the original shipwreck story just because it's more engrossing, even if it's less believable? Or do you accept the plausible but boring story Pi gives to the officials after he's rescued? Fanciful religious allegories or cold, scientific recitation of facts that might come from the mouth of an atheist -- we're expected to pick one or the other. But it's a false dichotomy. We needn't make a choice between embracing religious tales merely because they're more interesting or settling for the sobering realities of science and reason. We can go as far as our reason will take us and then leave ourselves open to further possibilities -- just as Pi himself suggests. That's not immobility. That's intellectual honesty -- an admission that I don't know all the answers but am willing to keep an open mind about whatever else is presented to me. Seems better than saying you might as well just accept the better story since it really makes no difference. That's laziness. And it doesn't make for a very good story. 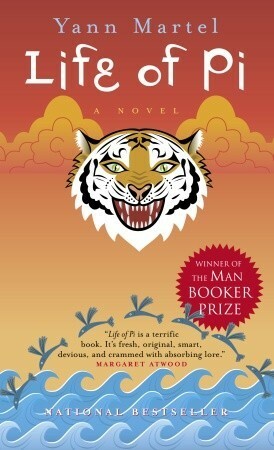 Sign into Goodreads to see if any of your friends have read Life of Pi. Did you just write a book review... for a novel that won the Booker Prize... comparing it to an episode of Dallas? What is truth, but the perception of a person. The belive of their own truth. This story, journey belonged to Pi... not you. Well perhaps Pi and Richard Parker. What does it say about you... to which story of Pi's you believe. "I don't know all the answers but am willing to keep an open mind about whatever else is presented to me." I am sorry but that is quite honestly not true. I think you may have missed the point of this book. It's not so complicated. Has anybody given it a thought that this book has a connection with the "Old Man and the sea" - Ernest Hemingway. Veronica wrote: "Has anybody given it a thought that this book has a connection with the "Old Man and the sea" - Ernest Hemingway." Compound that thought further... what connection do you see aside from the obvious. Everything can be connected to The Old Man and the Sea, because it's a one-hundred-page book with terse sentences where every single thing that happens is symbolic for something else; you can literally link it to every piece of literature ever written. Anyways, I enjoyed reading your review; the book was terrible. It would not be that obvious, if you had not read "the old man and the sea". My further thoughts on this book... would be like adding sugar to honey, the damn thing has already achieved a booker prize award, how much more glory do I need to spill on it. hahaha... tsorningold. you must be joking. that was an epic episode of "dallas". i mean, a booker award is great an all, but let's be real. "dallas" won multiple emmys AND golden globes... and let us not forget the creme de la creme of television validation: several "soap opera digest" awards!!! i think that's really the only plot line that wasn't covered by "dallas", actually. have to agree, a terribly overrated book.. Considering the length of your review, Life of Pi obviously made you feel something. And that's what stories ate supposed to do, aren't they? Also, nobody watched Dallas. Especially people who know how to read. I definitely felt duped and dissatisfied after reading it. I loved it so much until he went blind. It all spiraled south after that point. I loved your review. The book is loathsome, and Martel's philosophy makes me want to have a cerebral aneurysm. I just watched the Life Of Pi movie last night, and it brought up my conflicted thoughts about this book, which I read years ago. You stated all of my same objections pretty much perfectly, so it's good to know I'm not the only one thinking these things. Agreed. You clearly pegged down every single thing that irritated me about this book, and even one thing that I had forgotten to mention (how much Pi is just a mouthpiece for Martel). Thank you very much for your review. This book was a waste of $10. Agreed. saying the book isnt realistic or pragmatical or that it doesnt propose a plausible philosophy is missing the point of it. i never felt i was draged in a dilema, its pretty obvious which of the two stories was the real one. to me the book explained the use of religion to a peoples moral, not the world or reality or the existance of god. i never had a doubt in my life that god doesnt exist, but religion is obviously serving a goal culturaly, it feeds a human need. the book made me believe in the use god has for humans. escapism is what that need is and its pretty usefull in some cases ( when you re lost all alone in the pacific for instance). You people disgust me and this review disgusts me. There is a difference between fantasy and reality. Every who said this was bad then you are saying that with a boy trapped on a life boat with a Bengal tiger isn't exciting?! Especially its a true story how can you be angry on how he went blind or how the story went what would the guy do lie about his thrilling adventure? In my opinion this story was TRUE, exciting and very suspenseful yes at points it was boring but every book is boring here and there or just constant action would end up dull. I find it bizarre to argue with a book review. While I don't agree on every point made, one must be able to distinguish reading a book critically with reading book for glee. A review is an analytical exercise, and of all the reviews that I have read, most are willing to at least concede the problems in the voice and narrative distance in Parts 2 and 3. It's not a masterfully written work after Part I, unless you adore tedious albeit arresting description. And it's NOT well ended. That is the editor's fault. I get more spiritual meaning in my Star Trek novels and my Dwayne Dyer podcasts. The thought of picking and choosing from separate religions to find the essence of god is not groundbreaking. It is the heart of a philosophy of religious studies degree. Many of us have them, so I wasn't expect the author to be so heavy handed. If he had finished the REAL novel, Part I, and written Part II as a sequential narrative, I would have loved that. Great review. I am so exhausted with authors trying to create a black and white world (i.e. those with faith & those without). Everyone I've talked to loves the book because of the "wonderful story about animals". Call me whatever you will, but I have to agree with you about the world. Reality is reality, it is not just whatever version of it we want to see. Yes there is being an optimist or pessimist but I'd say Pi's story is far beyond that league. Just because you are a realist does not make you incapable of faith or religion just like the reverse is also true. I disagree with the message of this book and I can't stand that it is so enormously praised. I totally respect your review and actually found parts of it interesting, however I must point out one thing: yes, the novel is about escapism - and considering the fact that the main character is stranded on a boat for 7 months, I think the circumstances make a little bit of escapism okay! I doubt Martel was trying to let Pi 'run away from his problems', he was trying to show that there are many different ways in which you can find hope from within, and find the ability to go on with life, no matter the struggle. I found this book inspiring and fascinating, and loved the escapism. i am a child and i did not even flinch. i also loved the book and thought it deserved more than just one star. that "clever twist" you seemed to hate so much was actually two versions of reality and you were meant to choose between the two. besides, one tiny percentage of the book should not impact on the whole story. overall o was disappointed with your review and if i could, i would rate it one star.